Acumatica, the fastest-growing cloud ERP company, today announced its first International Integrated Solutions Providers Tour featuring innovative mobile or cloud-based business software built on Acumatica’s cloud ERP (enterprise resource planning) platform. More than 200 partners and customers are expected at the events across Ho Chi Minh City in Vietnam, Phnom Penh in Cambodia, Manila in Philippines and Jakarta in Indonesia, and plans for the Tour to go to South Africa are underway. Acumatica Integrated Solutions Providers Tour 2015 showcases the innovative solutions with deep vertical-specific expertise, in areas such as retail, manufacturing, business intelligence, warehouse management, distribution management and more. Such localized focus will help businesses of all sizes address their business and management needs-- from warehousing to retail management, from accounting to human resource management, and from data management to business intelligence – quickly and in a cost-efficient manner through cloud and mobile platforms. “Businesses and organizations large and small want robust software solutions that can help their management empower their people to make the right decisions, maintain profitability and build a sustainable future ahead. 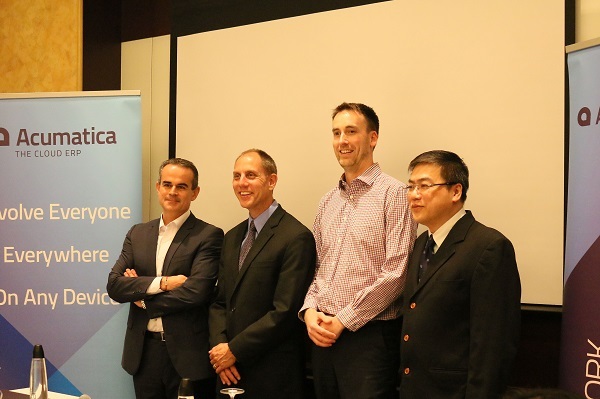 Acumatica is proud be able to meet their needs with our strong line-up of business solutions created by our growing stable of international and local independent software vendors,” said Jon Roskill, Chief Executive Officer, Acumatica. “Asian businesses are growing and expanding rapidly beyond their shores. To support their growth, customers are demanding user-friendly world-class business and management solutions based on industry best practices and global standards of compliance. Acumatica is able to offer them the solutions that allow their users to work anywhere at any time and on any device,” said Laurent Dedenis, President, International Operations, Acumatica. C-level executives, business leaders, entrepreneurs and functional leaders from industries such as discrete manufacturing, retail (F&B and lifestyle brands), property and real estate management, mining and FMCG (fast moving consumer goods) will have opportunities to meet and discuss with local, regional and international solutions developers such as AccelTech for their retail solution (Infosoft) and the RIC Group for their warehouse management system. Organisations in 30 countries worldwide are using Acumatica’s ERP software to manage their operations, improve profitability and build sustainable businesses. These include international and Asian brands such as Abbott Nutrition, BreadTalk, Calpis, KFC, Pizza Hut, Samsung, Singha and Leo Beers, TH True Milk, Tan Hiep Phat Beverage Group (THP), Yamazaki bakery and Vina AceCook. In the Philippines, Acumatica’s users include brands such as Armadillo Holdings Inc which manages The Legend brand of hotels and resorts, Big Scoop and Himlayang Pilipino Inc. Since 2008, Acumatica has been providing innovative business management solutions to help local independent software vendors build and create solutions to address complex business challenges faced by customers in local, regional and international markets.